Stereo view of the ridge between the east and west facets. The ridge is another interesting region between two distinct terrain areas separated by vertical relief. When viewed in stereo, the ridge is seen to consist of multiple layers. One idea is that the layers represent multiple, low velocity impacts during formation of the comet in the Kuiper Belt. ITS frame from -23.1°, 291.93°; range = 2114 km. MRI frame from -44, 303; range = 1238 km. 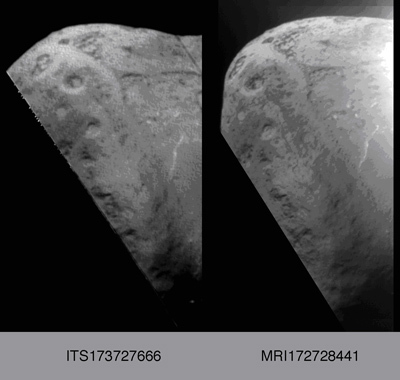 The image is rotated about 90° counterclockwise from our usual presentations in order to facilitate stereo viewing. When viewed with their centers about 7 cm (3 inches) apart, the images should appear 3 dimensional.